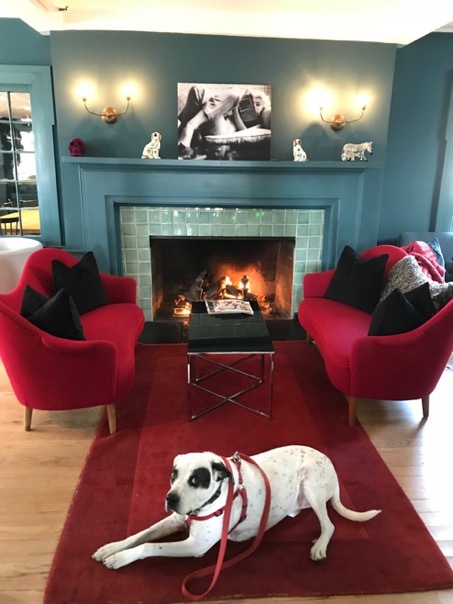 We love art and design and have filled our hotel with designer furniture, iconic glassware and small little things that we have found on our journeys. You will find them all around the hotel, in the hotel rooms, in the restaurant, in the lounge and in the garden. You can read all about our art collection here, and all about the design below. Arne Jacobsen designed the iconic AJ lamp for the SAS hotel in Copenhagen in 1957. 60 years later it is still one of the coolest lamps on the market. Designed in 1955 by Yngve Ekström, still in production by Stolab. Floor lamp model A810, designed in 1958 by Alvar Aalto & flower mono coffee table designed by Christine Schwarzer for Swedese. 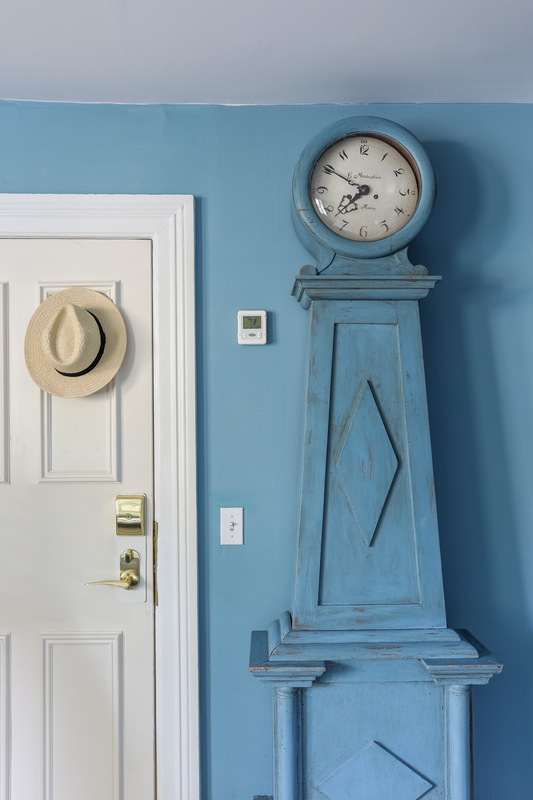 Mora clocks have been produced in Scandinavia since the 15th century. Every wealthy home had at least one to show off their splendor. Our favorite spot in front of the fire flanked by two Samsas sofas designed by Carl Malmsten in 1960. CPB 2101, designed by Prince Carl Philip and Eric Ericson in 2010. Inspired by events from the Swedish history, it is the silhouette of the Tre Kronor Royal Palace, which burnt to the ground in 1697. 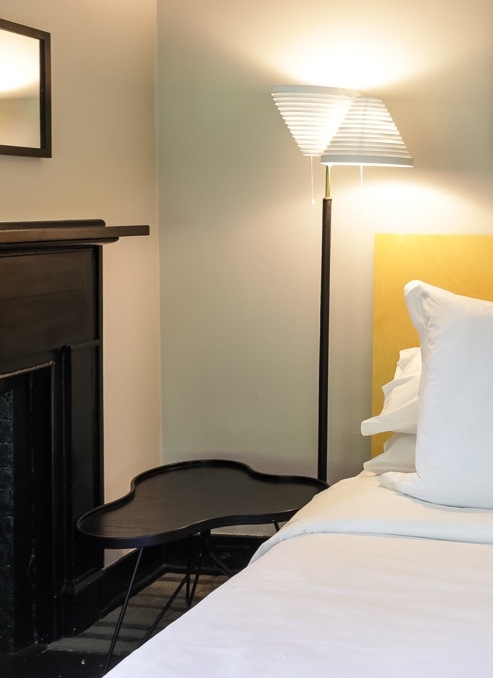 You will find the traditionally handmade Scandinavian Hästen beds in all of our hotel rooms. The cute and handy DLM table was designed by Danish designer Thomas Bentzen for HAY. The Tulip chair was designed by Eero Saarinen in 1955 for the Knoll company of New York City. 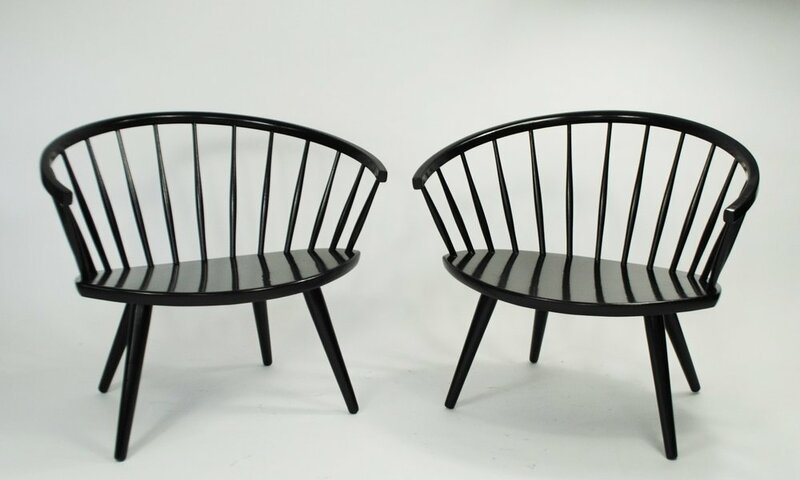 Artur Lindqvist designed the garden furniture for the Stockholm exhibit in 1930, it has been the most popular garned furniture in Scandinavia ever since. The colorful RGB lamp is deigned by Swede Fredrik Mattson for Zero. The golden bals are covered with real gold leaf. Iconic bunny boy lamp inspired inspired by plastic toys of the 1940's from UK firm Lapin & Me. The Lamino lounge chair was designed by Yngve Ekström for Swedese. This modern classic has been in continuous production ever since. 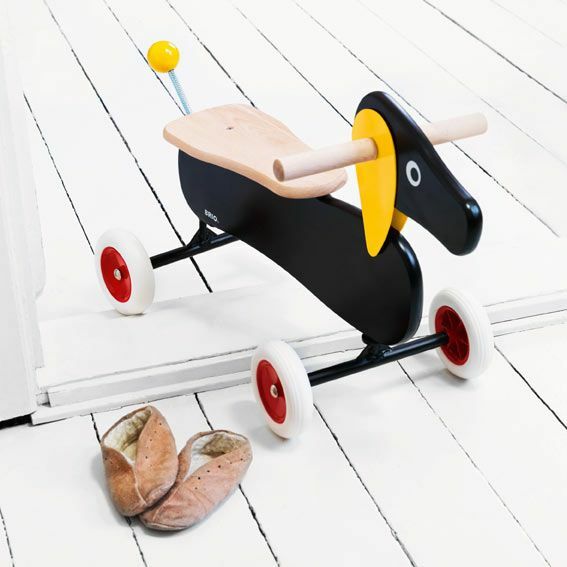 A few year ago the kid version Lamini was launched, which also became an instant classic. 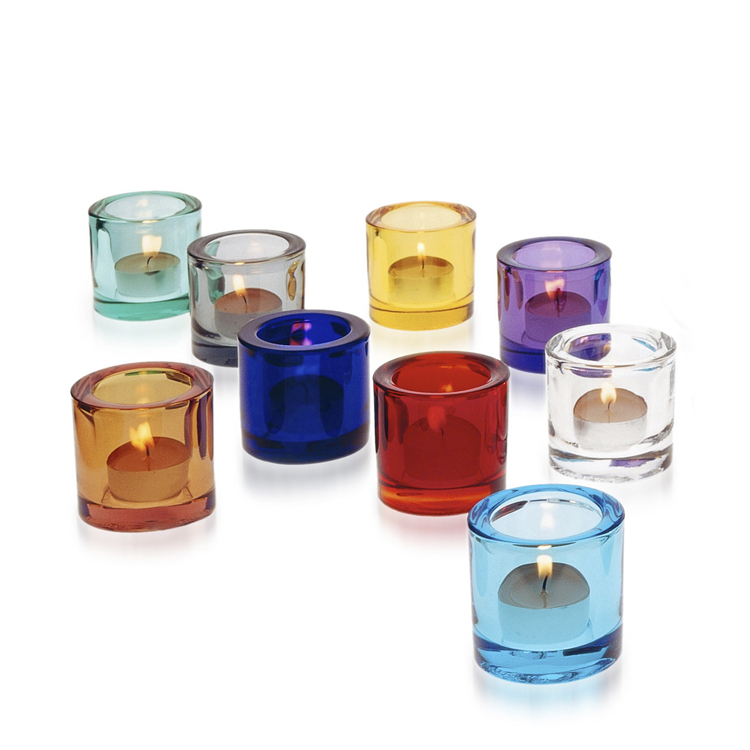 Austrian designer Alfredo Häberli designed Essence for Iittala in 2001. Essence is among the most highly acclaimed glassware in the world, and has won both the iF Award and Les Découvertes Award. Goose Lamp designed by Don Featherstone, New York. Our beloved vintage goose is a true rescue, salvaged from a sidewalk in Manhattan by our owner, as it was just sitting there waiting for the garbage truck. Designer Lars Hofsjö has created Torp with vintage Swedish rag-rugs. Each rag-rug is unique, as is each Torp table. Lilla Åland is a Scandinavian classic, designed by Carl Malmsten in 1942. Made out of solid birch or oak, assembled with glue and precision without screws or nails. The Danish Modern movement began in the 1920s and peaked in the 1960's. It became incredibly popular and this small Scandinavian country exported their furniture all over the world. Teak was a favorite material, and a the vintage teak furniture is as sought after today as it was in it's hay day. Allmoge is traditional Swedish folk design, everyday objects made in the 1900's. Often adorned with colorful patterns. Alvar Aalto designed chair 66 in 1935. It is one of the most popular dining chairs by Alvar Aalto and is part of the permanent collection at MoMA. 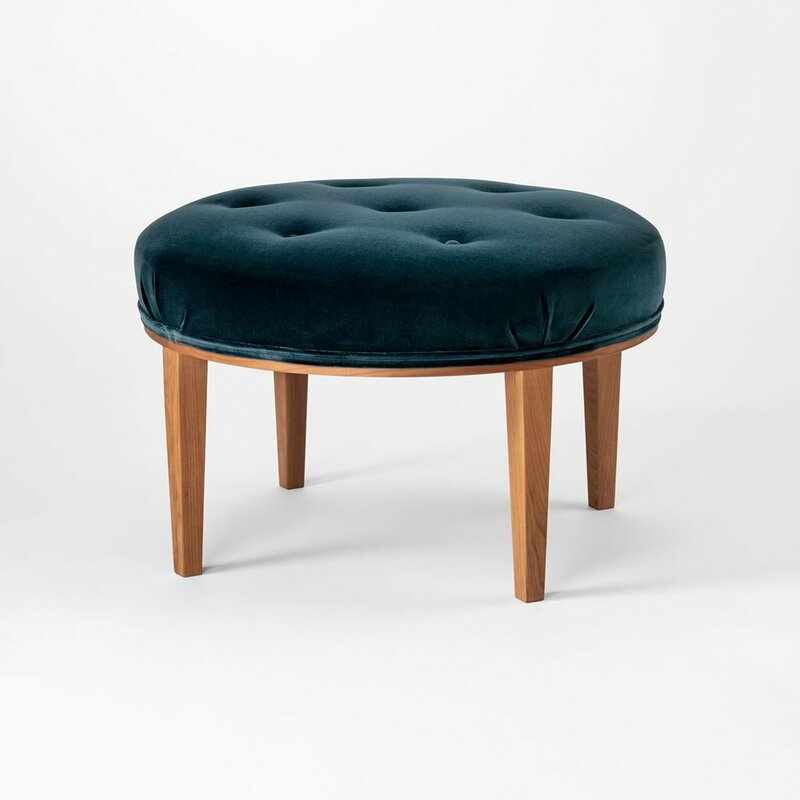 Foot Stool from Svenskt Tenn, designed by Josef Frank. 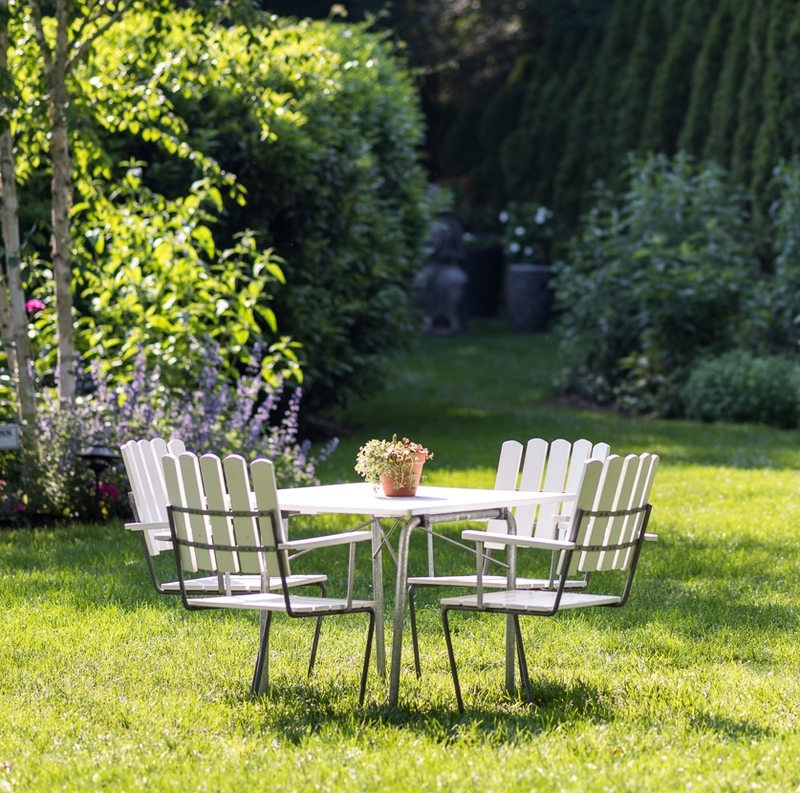 The swedish furniture company Byarums Bruk designs garden furniture and planters. All products are made in sandcasted recycled aluminium. "Gråsippa" is deigned by Swedish designer Signe Persson Melin. In 1936, Alvar Aalto’s series of glass vases won first prize in the 1936 Karhula-Iittala Glass Design Competition. Compared to the decorative objects of the time, the simple yet organic shape of this vase was a revolutionary statement. Today the vase is one of the most famous glass objects in the world. 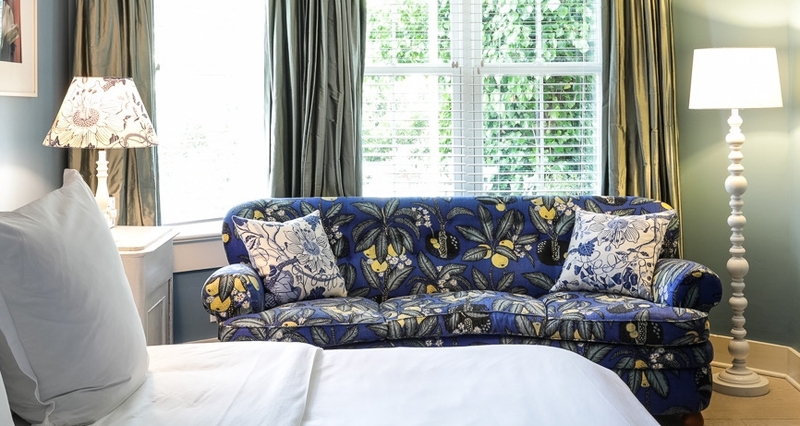 We of course love British design house, House of Hackney as they are famous for their bold modern prints. We have infused as many Palmeral cushions as we could fit into our public areas. Arne Emil Jacobsen, Hon. FAIA was a Danish architect and designer. He is remembered for his contribution to architectural Functionalism as well as for the worldwide success he enjoyed with simple but effective chair designs. Josef Frank had an enormous impact on the history of Swedish design. The Austrian architect is considered to be one of Sweden's most important designers. His colorful fabrics are still exclusively sold at Svenskt Tenn in Stockholm. Verner Panton is considered one of Denmark's most influential 20th-century furniture and interior designers. Unlike most of his fellow Scandinavian designers his designs are like color explosions. We have a lot of Scandinavian vintage furniture, designers unknown. Things we have picked up in antique shops in Sweden, made by skillful craftsmen in the 1900's. Hanna Werning is Swedish graphic designer who has been internationally awarded for her innovative wallpapers. 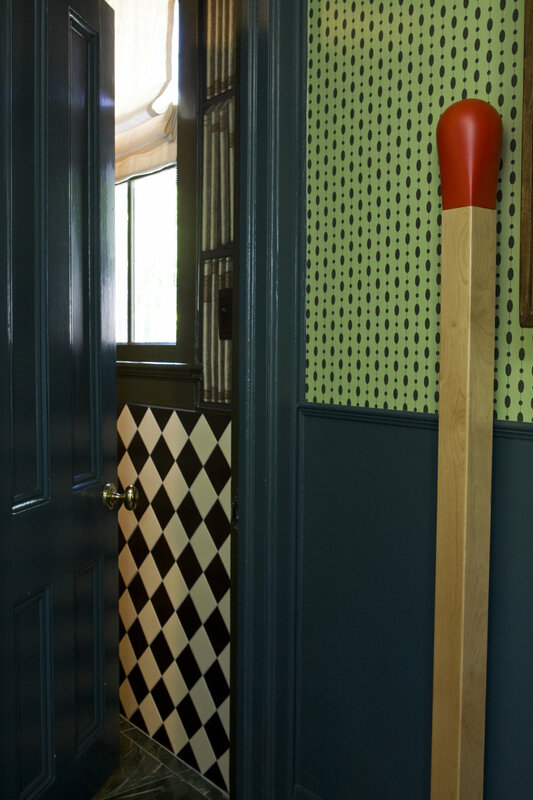 We put the Chestnut Thrust wallpaper in Josef Frank's bathroom. Kivi, meaning “stone” in Finnish, are small jewels of light designed by Heikki Orvola in 1988. Classic tray from Svenskt Tenn, with a Josef Frank pattern. The Nobel cutlery was made to mark the 90th anniversary of the Nobel Prize. It is designed by Swedish designer Gunnar Syrén and produced by Skultuna. Thai designer Chaiyut Plypetch designed this fun lamp. 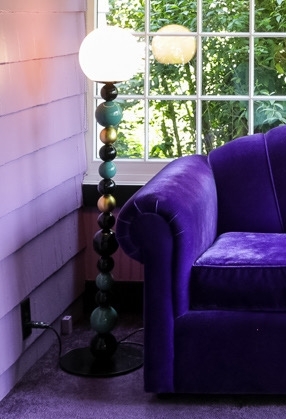 A perfect match for our HC Andersen room, author of the famous tale The Match Stick Girl.